Admittedly, I have fallen off of the outfit pictures train this week. But also, snowy wet weather doesn't lend to photographic creativity in moi, so this is what you'll have to deal with today. Plus I only took 2 outfit pictures and I have yet to follow the great prompts over on the Blended Blog...you'll have to see how the girls are styling boots. If it was me doing the prompt today, I would flashing my Sorels. Because snow. Outfit 1 is my homage to the Jays winning the Wild Card game last week against Baltimore. 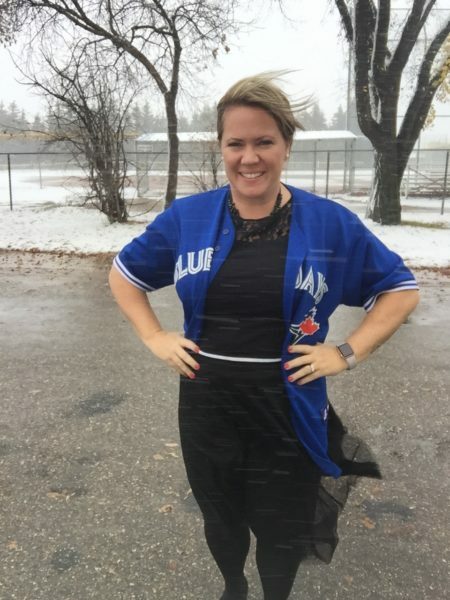 There has since been more winning and I will definitely be sporting some more Jays' inspired outfits. Black tulle skirt + black top and Bautista Jersey. I wore my plaid poncho to keep warm in the freak storm. The second outfit was my favourite. I felt very fallish and very french. 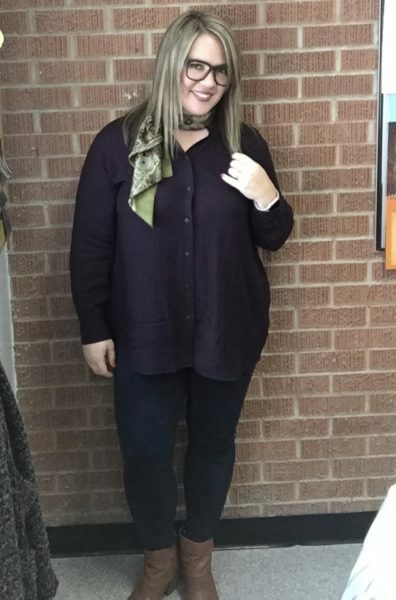 I wore my new Ines (here) top from Uniqlo, paired with navy suede leggings, my Sam Edelman boots and a scarf my broinlaw brought me back from France many moons ago. I love meeting new people via the blog and have added Katy to my growing feedly list of people I like to stalk online. I should really update the tab up top of blogs I follow. Thanks for the great scarf, Katy and thanks to Vanessa for organizing us! The scarf exchange sounds sooo fun!! I too love the Fallish/French outfit, so you and you look like a famous person! That last scarf is so cheery too and loving he colors pants!! All around cute looks from the cutest gal!! I love your french look and your neck scarf! 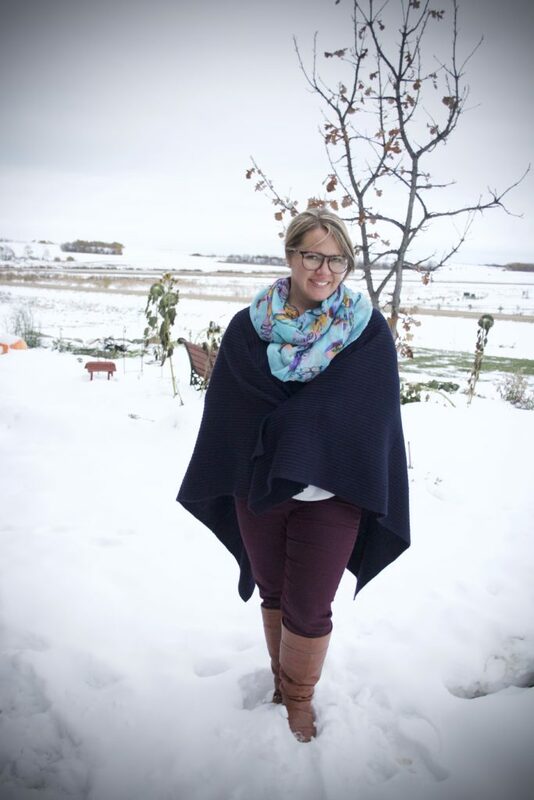 Your blue printed infinity scarf is so pretty! It blows my mind to see it so cold and snowy there! I adore your plaid poncho. So pretty. I love the all black outfit, something I never think to do. You know me and color..... You look B-U-tiful. So glad you like it and love how you styled it! So fun connecting with you!! Enjoy all that cold weather - my hair uncurled in about 2 seconds today with this humidity! GAH! Ohh! I love that French-looking outfit too! You look so cozy in all of your snowy weather stuff! I can't believe that winter is practically here in your neck of the woods! Love every outfit, but especially the french one. The scarf is tres chic! I promise there will be NO snow when you get to my house! I always love your outfits! And I love that blue scarf Katy sent you! It looks great on you! Thanks for participating! I'm drooling over the plaid poncho. And yes, I see French in the French teacher's look. That scarf brings a little light to this dark time of the year that's been sprung on us so suddenly. So much fun to get presents in the mail! It looks soooooo cold! I love it! Obsessed with pretty much the scenery and these looks. The scarf is such a perfect finishing touch! I cannot believe you guys are knee-deep in winter and we are still roasting through summer. High of 90s this weekend so hard to think about boots and wraps. Love your oh, so chic-Frenchish look. I can't believe you have snow already! I love the plaid poncho. The second - French-inspired look is my favorite. Oh my goodness the snow!! Need to break out my ponchos, STAT. :) Love these winter-y looks, lady! I love your poncho dear!! I can't even pick a favorite! Can I just say all of them, all those ponchos...swoon. What a great scarf you got too. The french look was my fave! What's humidity :( Thanks again for the lovely and warm scarf! Yup, the french is my fave too. Can't wait to see your world. It is very picturesque but man, it's a shocker when I was in sandals the day before. 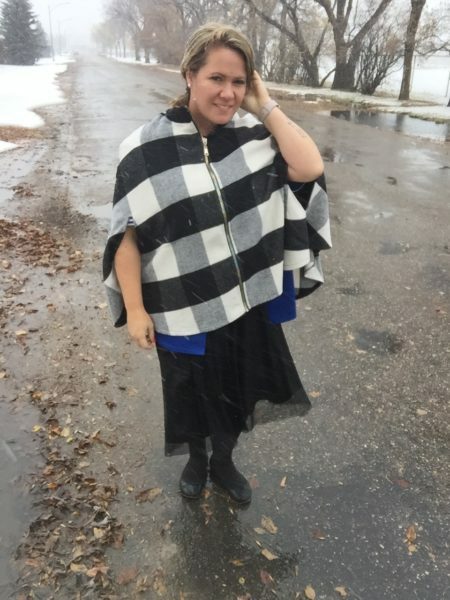 capes and ponchos are my fave fall piece! Yup, no roasting for us :( It will be melted by next week though, I'm sure. I suppose it's inevitable. Just a little early though. Tulle and a jersey? Sounds and looks like a solid plan.